Inspiring learners of all ages! Since the firm’s founding in 1959, TMP Architecture has been focused on designing the finest educational buildings for academics, student life, the arts, sciences, sports and recreation, and health and wellness. Our passion for lifelong learning continues today, successfully serving thousands of districts, colleges, universities and communities across the country. Awards for innovative architectural planning and design attest to our firm’s ability to deliver responsive facility solutions that promote learner growth and success. We care about you! TMP maintains a culture of high service and quality. Our client-centered designs are delivered with collaboration, communication and responsiveness at every phase of development. We know what questions to ask, but more importantly we know that listening is paramount. Our goal is to create a truly responsive facility that becomes a point of pride and a tool for growth and success for every client. TMP Architecture is a professional Midwest architecture firm of creatively focused individuals who specialize in the planning and design of educational facilities for all stages of life. Expertise in learning environments for the arts, sciences, sports and recreation, health and wellness, and media is reinforced by a commitment to client service, project value, and innovative solutions. We commit ourselves to practice rooted in design and technical quality, sustainability, professional ethics, and collaboration. As a premier architecture firm in Michigan, we have provided a full range of planning and architectural services since 1959, from programming and site evaluation to interior design and full field services. The following list highlights our comprehensive in-house services. In addition to our design and planning, TMP offers numerous services to help clients prepare successful campaign and fundraising programs, from conceptualization to implementation. In the past decade we have assisted clients on over $4 billion of successful programs, with 90% of them passing on the first attempt. TMP’s Interior Design Group brings an added level of creativity and technical design to each project. Our team of talented and creative interior designers has strength in numbers and in expertise, with a combined total of 140 years! They enjoy the challenges of creating unique, safe, functional, and exciting built environments. 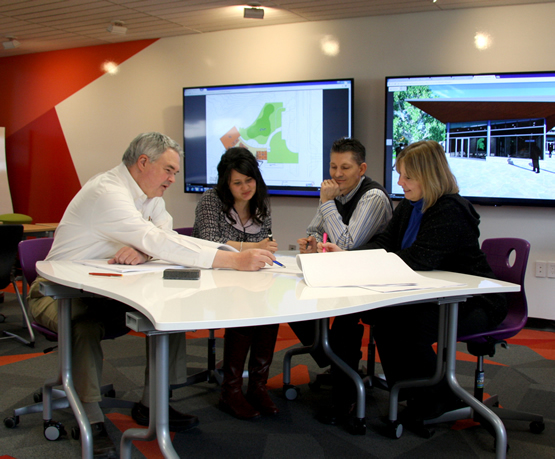 Our interior design team plans and specifies each component of the facility’s interior, from furniture for learning spaces and collaboration areas to administrative offices and specialty labs. They are involved from the onset of planning and programming, and maintain services during and beyond the installation of furniture, fixtures and equipment. TMP Interior Designers focus on student-centered design and excel at discovering the best interior solutions for each client. Green design is nothing new, and is standard practice for TMP’s projects. Our commitment to high-performance spaces spans the firm’s nearly 60-year history. From our earliest solar and energy conservation projects to our present day LEED Certified projects at all levels, our team has consistently been solidly committed to utilizing sustainable techniques in the design of new and renovated facilities. By adapting a prototype design, TMP clients are able to gain ideal facilities while meeting ambitious schedules and budgets. TMP has developed prototype programs at all levels of education, allowing the ability for clients to physically tour the design before building it. Many of these TMP designs have received honors from educational and architectural organizations for their creative design and function.